Irish Garden House: Random 5 Friday . . .
Random 5 Friday . . .
1. I think I happened upon the Aleutian Cackling Goose breed the other day on my "me day adventure." There were ten or more geese in this small park I visited. I seldom see other people in the park . . . shhhhh . . I think I will keep this as my special interlude place to visit. 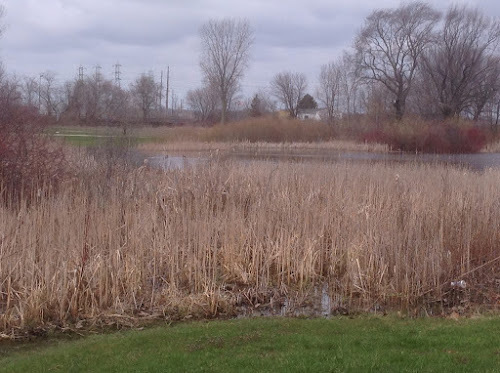 I noticed that someone had posted a sign saying, "four laps around the pond equals one mile." Hmmmm, a new scenic walking spot! 2. 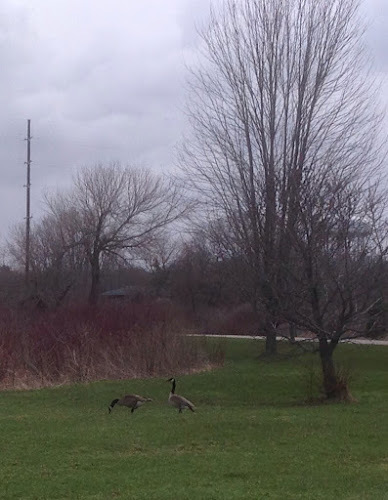 Don't you think these geese will make it a perfect time for me to join Eileen and Saturday's Critters . . .? 3. Yesterday I reached the finish line of my spring clean up. One month ago I spent two weeks raking and cleaning up sticks, oak leaves, "stuff" that accumulated over the winter. I raked the piles and my mister Irish man did the pick up and the taking away. Then winter returned and I waited for some non snow days and a bit warmer. It happened this week, sixty two yesterday. More clean up . . . finish line! 4. My oldest had a birthday yesterday. Born 4/14/64. 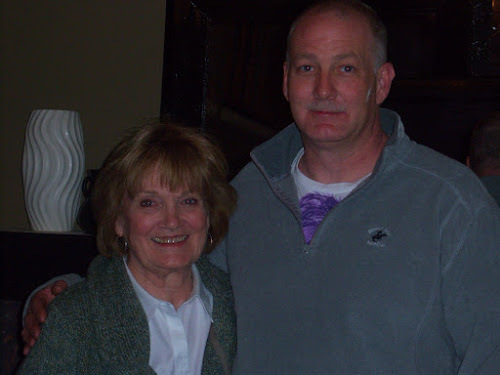 Here he is with his momma four years ago. And this makes me older than 52 and that is another story! We will be going to his house on Saturday for some family birthday time. I am making Scotch-a-Roos, his favorite. 5. I went digging back in blogging history to see what happened four years ago on 4/14/2012. I knew what had happened, I just couldn't remember how many years. We were having a birthday celebration at our home for my son Scott on that day. Early that morning while I was filling the bird feeders 'I met up with this feeder.' 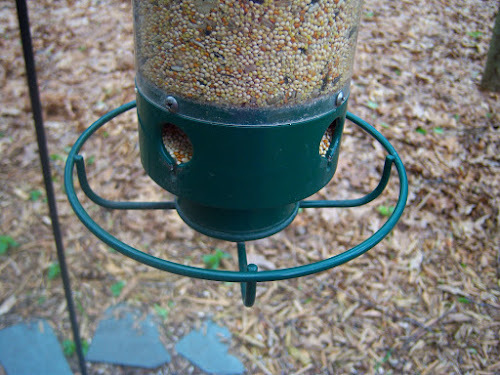 This is a great feeder to keep the squirrels away, not so nice on fingers though. If the squirrel jumps on that round ring, their weight whirls and twirls them around and they get tossed off the feeder. The birds love it, the squirrels, not so much, they get the leftovers on the ground. Back to this momentous day. I set the feeder on the ground, did not turn off the device that makes the ring twirl and when I picked up the container of seed, the twirly ring grabbed my right ring finger and twirled it around the ring. OUCH !! Long story shortened, bad injury, almost lost my finger. Big time surgery to try and repair one little finger!. I thought this would be a perfect random thought for Nancy's Random 5 Friday (We ended up enjoying Scott's birthday that day after making a few trips to emergency. Surgery happened a few days later.) The feeder is still in use, although the battery operated ring device has been removed. Now the birds and squirrels eat together . . . Your finger story had me grimacing! It sounded terrible and glad it's healed...it is healed, right? Goodness about your finger, wow! I love that little park and yes I rarely see anybody there either. Congratulations on the clean up. It is perpetual around here. Hello Lynne, I enjoyed your randoms. Sorry about the finger injury, that must have hurt. The pond looks like a pretty place for a walk and watching the wildlife. 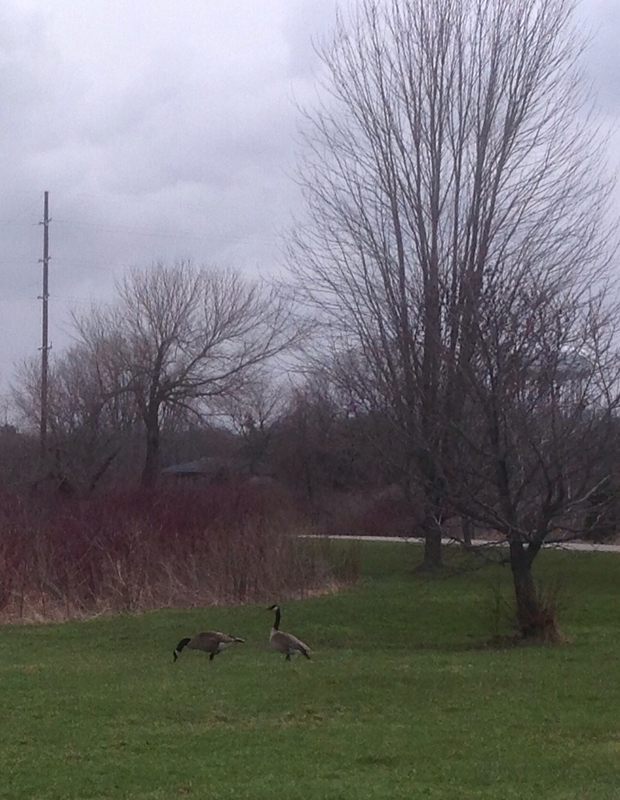 I love the geese. Happy Birthday to your son! Enjoy the great weather. Thank you so much for linking up and sharing your post. Have a happy weekend! I was getting all geeked up about a bird feeder that would keep Bushy away till I heard the finger part. Guess we'll just keep pounding on the window! Good grief, Lynne! That is terrible. Can you just imagine what would happen if it caught a child? I hope they rethink that brilliant idea before someone DOES lose a finger. That's a memory that would certain be one that stuck in one's memory!! p.s. I loved that you found such a beautiful place to walk and think and be still...Nothing like that for miles and miles around here. It's wonderful you have it. Oh gosh, a person wouldn't forget that event! Yikes! I'm glad they were able to save your finger! Happy birthday to your son. The weather is cooperating now. Yay! OH my goodness, that does not sound like a pleasant day. I am glad your finger is ok and that day is just a memory now. Hope the birthday celebration was fun! You don't look a day over 52 to me! I love that you made his favorite treat- I pray that I can continue to do that for my sons as they gown into adulthood.